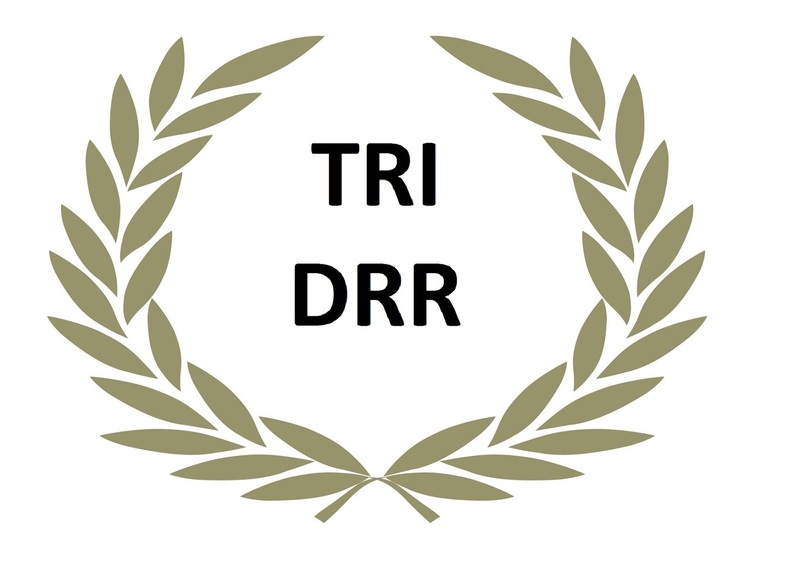 Three Regional Initiatives for Disaster Risk Reduction "TRI-DRR"
The Alliance for UDRR (AUDRR) needs to be built by collaboration among stakeholders in different sectors and disciplines in each city. For Kobe, the local AUDRR is established by RCUSS. 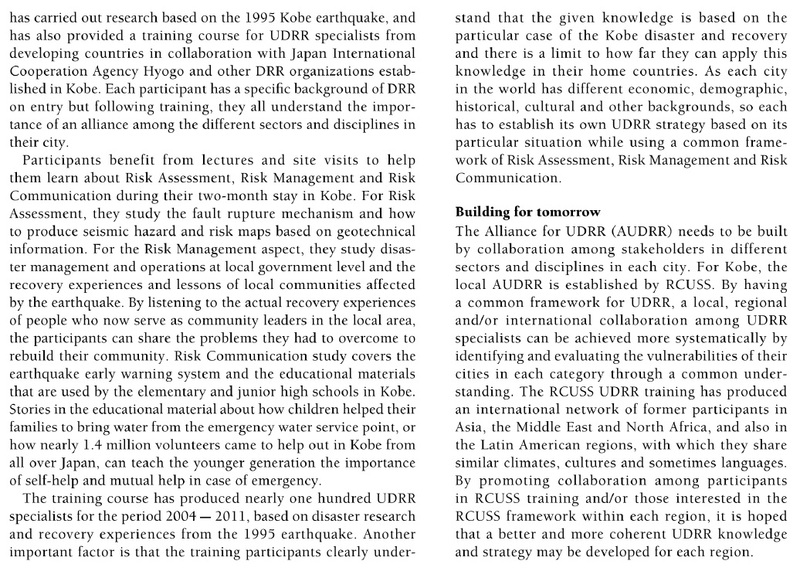 By having a common framework for UDRR, a local, regional and/or international collaboration among UDRR specialists can be achieved more systematically by identifying and evaluating the vulnerabilities of their cities in each category through a common under- standing. 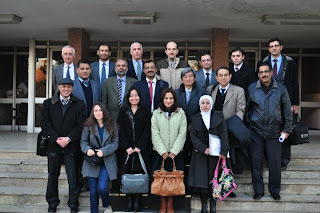 The RCUSS UDRR training has produced an international network of former participants in Asia, the Middle East and North Africa, and also in the Latin American regions, with which they share similar climates, cultures and sometimes languages. By promoting collaboration among participants in RCUSS training and/or those interested in the RCUSS framework within each region, it is hoped that a better and more coherent UDRR knowledge and strategy may be developed for each region. Disaster risk reduction of urban and built environment is essential to guarantee the healthy and industrious developments of core cities in developing countries. 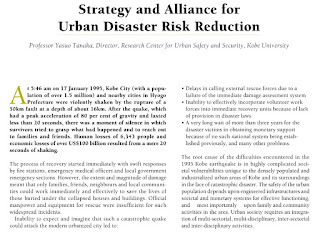 Specialists in Urban Disaster Risk Reduction (UDRR) are, however, not readily available because developing such specialists requires acquiring a comprehensive knowledge and understanding of both the scientific and the socio- economic conditions driving urban risks. Further, it requires a full heart of devotion and a commitment to bridging the people together. 3) Discuss the future strategy of UDRR network & activity among the Asia, MENA, and Latin America groups and the international organizations. 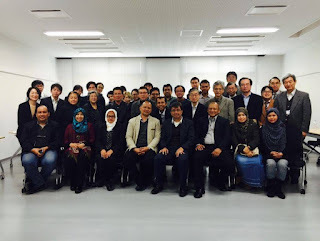 TRI-DRR PLATFORM established in order to strengthen the international network of ex-JICA group trainees on "DRR Strategy for Urban Earthquake and to maintain global network. For this purpose TRI-DRR PLATFORM Team join many international events such as 2012 AIWEST-DR Banda Aceh, Indonesia , 2011 Global Platform for DRR, 2013 Global Platform for DRR, 2015 UNWCDR, Japan. It is vital to have a strong and effective networking scheme that would unite a global efforts of urban DRR by experts. We will look forward your invitation and participation with TRI DRR. Developing resilient communities through participatory approaches. · Assessing impacts of disasters. · Capacity assessment of communities for disasters. · Enhancing capacity by imparting training to stakeholders. · Evaluation of ongoing risk assessment / management / communication activities of organizations in the field of disaster management. · Networking and capacity building. · Community awareness about disaster preparedness. 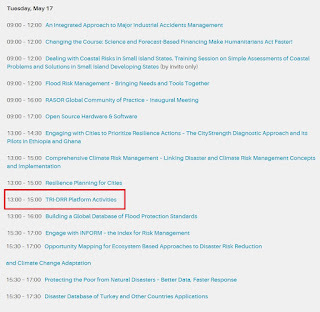 TRI DRR PLATFORM's side event "TRI DRR Platform Activities" will be on 17 MAY 2016 TUESDAY 13.00-15.00 You can register the event from: http://dev.lookus.net/ur2016/ you will click on the tab for TRI DRR Platform Activities at the middle of the list. Please announce for this important event to your colleagues and Ex-JICA Participants as well. As we are TRI DRR PLATFORM, a QUESTIONNAIRE is offer to your attention. A database will be established with your feed backs. Please fill it out! -To identify mitigation approaches to incorporate in the reconstruction process in Aceh. One important objective of the workshop is to discuss a framework for scientific and technical support to the reconstruction based on a collaborative undertaking between international organizations, national experts and local resources partnering with key agencies and organizations involved in the reconstruction. 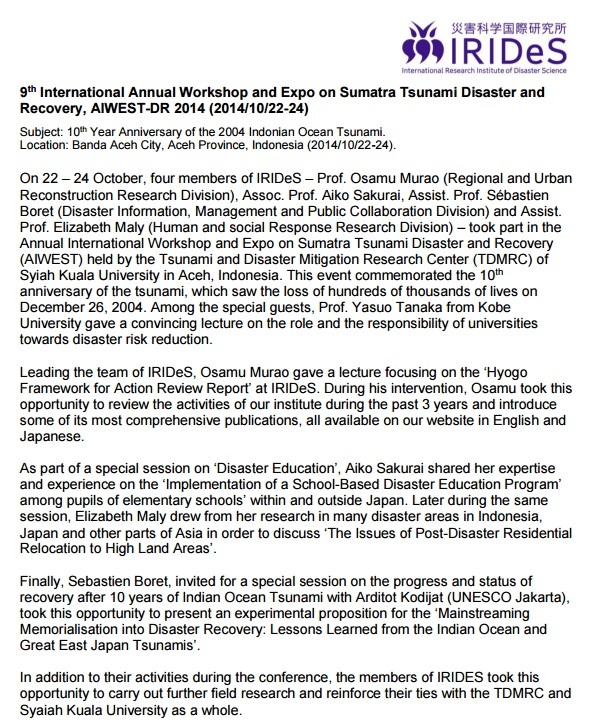 The first agenda of the 2012 AIWST-DR is a continuation of the international workshop organized by Syiah Kuala University of Banda Aceh which has been started in 2006 and jointly organized by Kobe University after the 2004 December Sumatra Tsunami disaster that has stricken many countries around the Indian Ocean. This international workshop aims to integrate all the efforts of the 2004 Indian Ocean or Sumatra tsunami hit countries to promote better recovery and reconstruction, and to share the knowledge of not only scientific and engineering but also of socio-economic, medical, cultural, educational, and other aspects related to disaster risk reduction based on the Disaster. Through a continuous workshop over a decade, it is hope that a sound strategy for "Building Back Better" from a catastrophic disaster is to be implemented in those cities and countries hit by disaster. 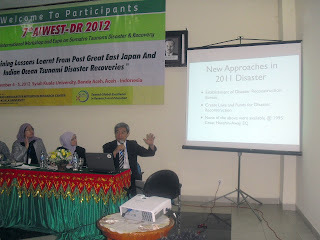 The first day of the seminar will be devoted to multi-disciplinary reconnaissance reports from international experts, experts from Japan, Central/Local Goverment, Syiah Kuala University representatives and ex-JICA group trainees on "DRR Strategy for Urban Earthquake" that was organized by Kobe Univ. & JICA Hyogo from 2004 to 2011. The workshop was open to all organizations, institutions and professionals who are involved or have a keen interest to contribute to the reconstruction of the Tsunami affected area, and in particular to Banda Aceh. Japanese researchers presented about “Recovery studies on the recent Great East Japan EQ & Tsunami”. They explained general information about Great Hanshin Awaji EQ (Mw 6,9) and GEJET (Mw 9.0). They also emphasized temporary and permanent housing activities, planning issue (relocating households etc.) , economic development and education. The group tried to explore possibilities for making its knowledge and expertise available to agencies in charge of the disaster management and to transfer this knowledge to national and local experts. Temporary housing and permanent housing in Japan after disaster. Regarding to Indonesia Scale, Officials presented recent disaster which occured in Indonesia. (Aceh tsunami (2005), Alor Earthquake (2005), Yogyakarta Earthquake (2006), Hot mud eruption Sidoarjo-LAPINDO (2006), Jakarta flooding (February 2007) and recovery plans. Massive destruction occured along 800 coastal line. Damage assesment was: 635.384 people displaced, 127.720 people killed and 93.285 missing, 139.195 houses destroyed, 22 sea ports, 119 bridges, 2.618 km roads, 669 government buildings, 3.415 school buildings, 517 health centers, 1.089 religious facilities destroyed, 20.000 ha fish ponds, 13.828 fishing boats destroyed, 73.869 ha agriculture land, 104.500 SMEs, 167.228 students lost their schools, 1.927 teachers died. Indonesian officials from Central/Local Goverment and Researchers emphasize recovery activities after disasters which struck Indonesia. -Continuation AIWEST DR and developing a framework for collaborative participation. The second day site visiting is organized. Participants visited tsunami affected areas and examined recovery activities. Kapal di Atas Rumah-Lampulo: The erathquake and tsunami disaster of 26th of december 2004 destroyed whole infrastuctures in Banda Aceh,and because of the tsunami wave, a wooden boat was in dock area in Krueng Aceh River in Lampulo. The wooden boat has 25 m length, 5.5 m. Width and 20 tons of weight. The earthquake and tsunami disaster has stranded the boat to the housing in Lampulo, which was approximately located 1 km away from the dock area. 56 people survived in the boat because of this incident. Municipality designed around it as open air memorial park. Baiturrahman Grand Mosque: The Mosque is Aceh’s inheritance from the Sultan Iskandar Muda era. It was built in 1612. The tsunami waves that struck Aceh submerged the mosque. While buildings nearby were heaviliy damaged, The Grand Mosque sustained only minor damages and was a refuge fort he thousands who fled to safety. Museum Tsunami Aceh: The Museum in memorail of the tsunami, which took approximately 240.000 victims in Nanggroe Aceh Darusselam on 26 December 2004. Detailed planning fort he tsunami monument and site started in august 2006 and the museum was built on approximately 10.000 square meters of land located near center of Banda Aceh with a budget of US $ 14.000.000. PLTD Apung: This electricity generator barge was docked at the Ulee Lheue port when the tsunami lifted it off the shore and it landed in a crowded housing settlement at Gampong Punge Blang Cut. The wave carried this 2.500 ton, 1600 m2 vessel four kilometers inland. From the top of the vessel, visitors can spot the BMW “edu park”, set up to provide interactive tsunami education to locals. The 4500 square meter park is equipped wwith tools that educate the people about tsunami and tell the sequence of a tsunami in a clear and understandable manner. This park clearly contributes to the effort of a community based early warning system. Kuburan Massal: Mass Grave is visited by participants. Several areas were selected for mass graves. During the first few days in the aftermath the disaster there was an urgent need to bury the remains of the dead. These mass grave sites dedicated to tsunami vistims. Syiah Kuala University Tsunami and Disaster Mitigation Research Center (TDMRC): TDMRC is a center for data, information, research work and consultation on all aspects of disaster to help increase disaster preparedness among the Acehnese people. This research facility aims to anticipate future tsunami along the Aceh coast and was established by the provincial goverment and run by Syiah Kuala University. In addition, the TDMRC facilities act as an escape building in case of tsunami and related disasters. There are five other escape building areas, located in Pidie, Lhokseumawe, Bireuen, Aceh Jaya and West Aceh. Tsunami Height Memorial Poles: Memorial Poles indicate tsunami waves location and height of tsunami waves. This Project carried out by Japan Earthquake and Tsunami Team (JETT). Measuring ground height and position by barometer and GPS device. And also some education programs are organized with this project. Mesjid Raya: Various housing being constructed in this area. It is located about 17 kilometers from Banda Aceh. Permanent housing projects and residentual problems are examined. 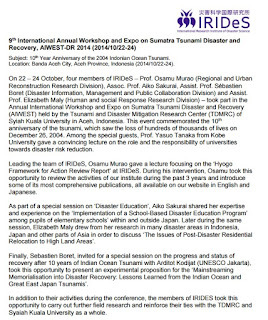 The -7th Annual International Workshop and Expo on Sumatra Tsunami Disaster and Recovery (AIWEST-DR) 2012 was successfully held at Syiah Kuala University in Banda Aceh, Indonesia on December 4th 2012. Following three technical sessions during the day, a round table meeting is held to discuss the future action of AIWEST-DR and necessary activities to promote DRR ( Disaster Risk Reduction). We, the participants of the round table meeting, encourage the Tsunami and Disaster Mitigation Research Center (TDMRC) of Syiah Kuala University to follow-up further activities to promote DRR based on the 2004 Indian Ocean Tsunami disaster. To share experience, knowledge and lesson learnt about the disaster risk management from the Sumatran tsunami disaster among the other earthquake and tsunami-disaster-prone countries that will make difference for future mitigation strategy. To share experience on disaster preparedness through educational system in the earthquake and tsunami-disaster-prone countries. To enhance public awareness on how to survive the tsunami disaster and to take into account the evacuation strategy, including for city transport as well as for children, elderly and disable people. To share experiences on technological development on building either temporary shelter or permanent housing that meet the condition of the earthquake-prone and tsunami-prone area. To promote the concept of monitoring and early warning system that are decentralized so local government can have direct control to the disaster preparedness. To expand the networking of internet training as a tool for early warning system among the stakeholders involved in disaster preparedness actions, as well as to enhance public awareness on disaster mitigation strategy. To maintain Science-based disaster risk management strategy and to inform the output of AIWEST DR to the responsible government representatives in order to make the disaster management strategy can be well-implemented. To follow up the results of scientific discussion during the AIWEST DR 2012 into declaration to continue supporting the scientific-based and contextual to the socio-economic and cultural background that can be understandable to the society. To use the momentum to suggest the ‘National Day’ of Sumatra Tsunami disaster and to make the memorial day to be part of the educational curriculum for school children and society. To develop annual drill program. To engage the national and provincial government in financing the commemoration as the follow up of the Yogyakarta declaration on the 5th AMCDRR. To organize conference that invites all stakeholders involved during the tsunami disaster rehabilitation and reconstruction. To initiate (mangrove) tree plantations as a means of coastal protection that will represent the number of the tsunami disaster victims as the way to pass the tsunami education to the next generation. 3. To endorse future collaborative works among stakeholders involved in AIWEST DR. DRR proposals to attain external supports from potential donors, such as international organizators, NGO, national and local governments, and other institutions, can be produced through the network of AIWEST-DR participants. Since its first commencement in 2006 following the giant Indian Ocean tsunami of 26 December 2004, AIWEST-DR is regularly hosted by TDMRC and partners with supports from various DRR stakeholders, reflecting the high level of interest and participation in this international scientific workshop. This workshop is increasingly important considering the recurrence of catastrophic disasters in the world, such as the Great East Japan Earthquake and Tsunami 2011. 7THAIWEST-DR 2012 is intended to provide an opportunity to discuss how academia, governments and other organizations involved in DRR activities can work together to build back better disaster resilient society and to promote DRR through reconstruction by linking the Indian Ocean region with other disaster hit cities and countries. In this workshop, we focus on the lessons learnt and best practices from the recovery process of 2004 Indian Ocean tsunami, 2011 Great East Japan EQ & tsunami, and other disasters in the world that workshop participants present. 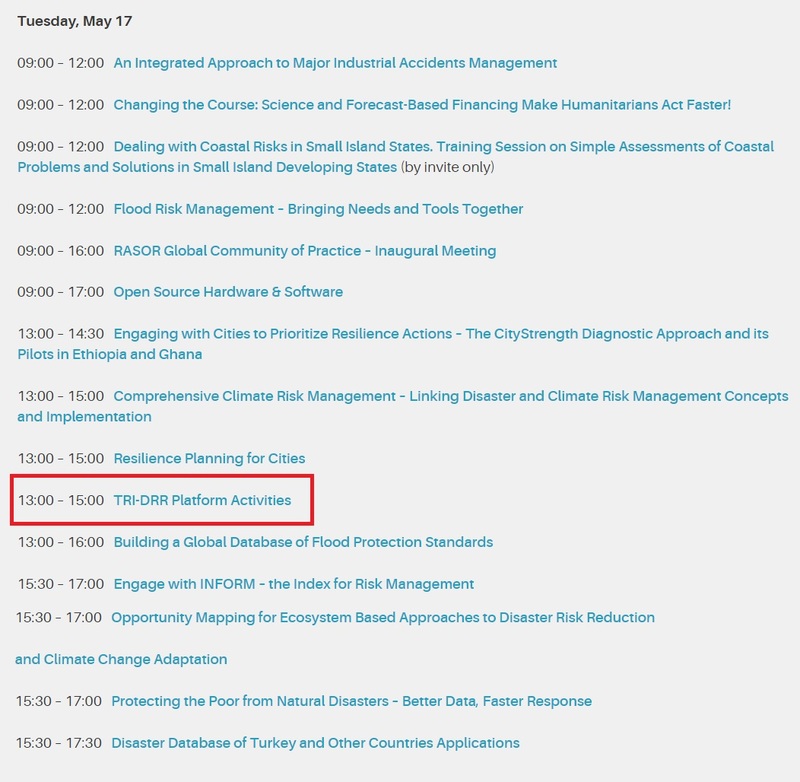 We have to disccuss how we can present our activities at 3 regions (Asia, MENA, LATAM) in the 4th Session of GPDRR (http://www.preventionweb.net/english/hyogo/GP/) in Geneva, in May 2013. The disaster risk reduction in an urban environment is essential to ensure the sustainable development of cities in developing countries. Specialists in reducing urban disaster risk (UDRR) are not readily available, because the formation of them requires a broad knowledge of science and understanding of socio-economic conditions that lead to risks urban. It also requires a heart full of devotion and commitment to save people. 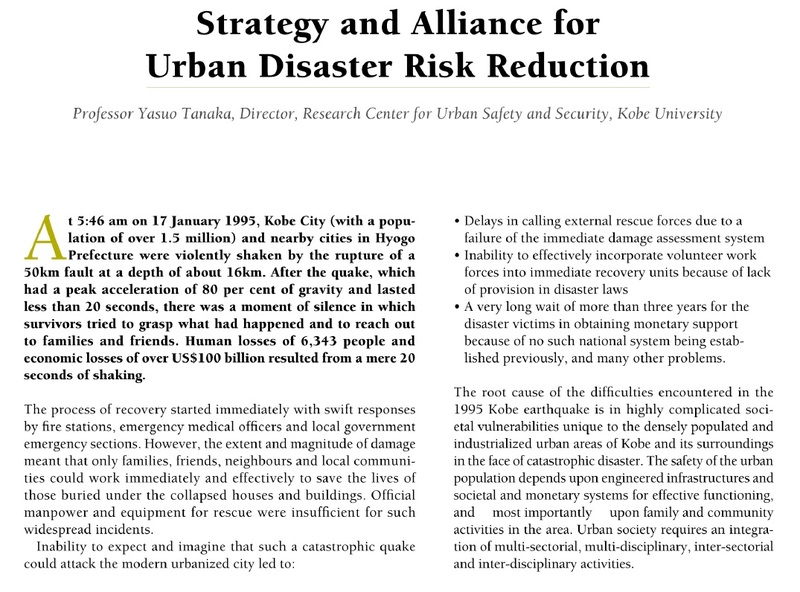 Based on the experience of the Kobe earthquake in 1995, which was a clear pattern of urban disaster and recovery, a group of specialists UDRR, Asia, Middle East and North Africa (MENA), and Latin America, have been trained through a joint effort between JICA Hyogo Research Center for Urban Safety - RCUSS Kobe University. For a period of eight years (2004-2011), more than 100 participants have completed two months of training in Japan. The group of participants has promoted regional workshops to promote mutual understanding of the issues in each region UDRR and thus further strengthen the international network among these specialists UDRR and organizations. 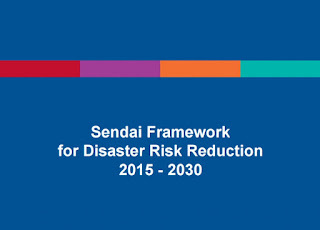 This document contains the policies, objectives and activities to be developed by the Association of Ex - JICA Alumni of the "Strategy for Earthquake Disaster Mitigation Mega-Urban", with support from RCUSS Kobe University, in order to give effect to the priorities set out in the Hyogo Framework for Action (Ensure that disaster risk reduction (DRR) is a national and local priority with a strong institutional basis for implementation.) as well as the seventh Millennium Development Goal (Ensuring environmental sustainability.) in accordance with the Disaster Risk Management – GRD (Disasters can wipe out any hope of developing sustainable urban and rural environments. If no policies are defined and implemented, it will be impossible to achieve the goal of improving the lives of at least 100 million slum dwellers by 2020.). a. Lack of critical mass of specialists trained in disaster risk reduction in the level technicians, professionals and executives in different countries and regions. 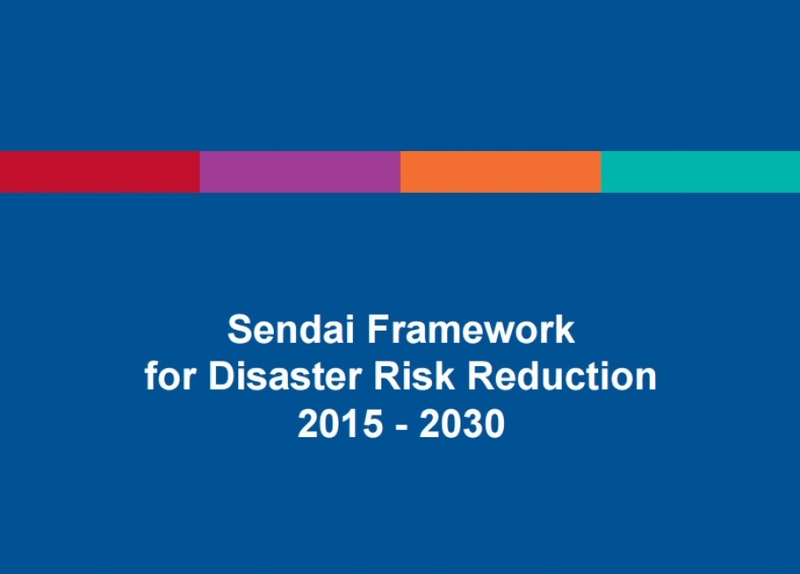 The culture of disaster prevention is not developed in the general population. b. The disaster management models are based on the management of the emergency and the help of the authorities, it is rare that there local groups trained and prepared to deal with disaster risks. c.The disaster risk management does not incorporate scientific advances in technology. d. There is no universal access to a Web portal for Training and Education Disaster Risk Management, and most are available in English. 1. 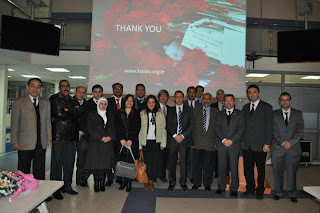 Create an NGO for undertaking the proposed objectives of the meetings of Pakistan 2011, Turkey 2011 and Colombia 2012. 2. 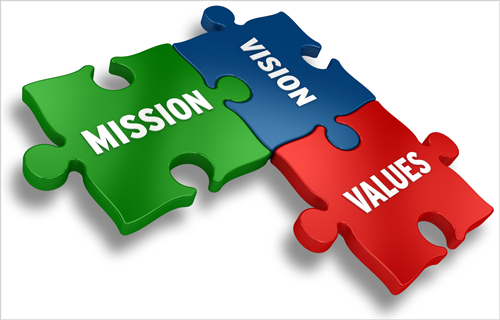 Obtaining financial and human resources to sustain the organization. 3. Optimize achieving development goals and activities through proper utilization of available resources. Being an organization that encourages, develops, promotes the process of disaster risk management through hazard identification, establishment of vulnerability and risk assessment. This process should be encouraged to society as a whole and particularly to the poor population and authorities of local governments in the areas most likely to suffer the ravages of nature. 1. Creating an organization international, regional (Asia, MENA and LATAM) and national in at least two countries in each region during 2012-2013. 2. Develop projects to obtain financing at the level of international cooperation and local goverments. 3. Develop a training program for 2012. 4. Develop regional workshops to strengthen alumni. (1 in 2012). 1. 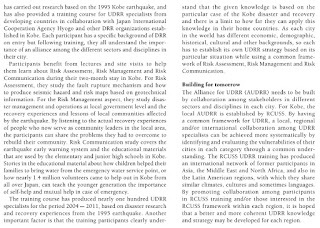 - Name of the program: Training course for Latin America in Reducing Urban Disaster Risk. 2. - Timeframe: 2012 to 2015 (four years). 3. 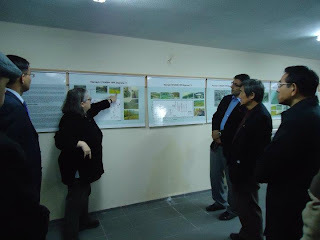 - General Purpose: To train local and national institutions of Latin America in Reducing Urban Disaster Risk. 4.3 Creating a platform for sharing information. 5.1. Develop a database of ex JICA fellow interested in participating in the project, with each profile, experience, and possible subject of the course. 5.2. Develop detailed project program and courses, subjects, duration, speakers, costs, etc. 5.3. Building two workshops for former fellows would conferencing training program and setting the contents. 5.5 Generate relevant course documents, guides, reports, etc..
· Course material and reports. Disaster risk reduction of urban and built environment is essential to guarantee the healthy and industrious developments of core cities in developing countries. 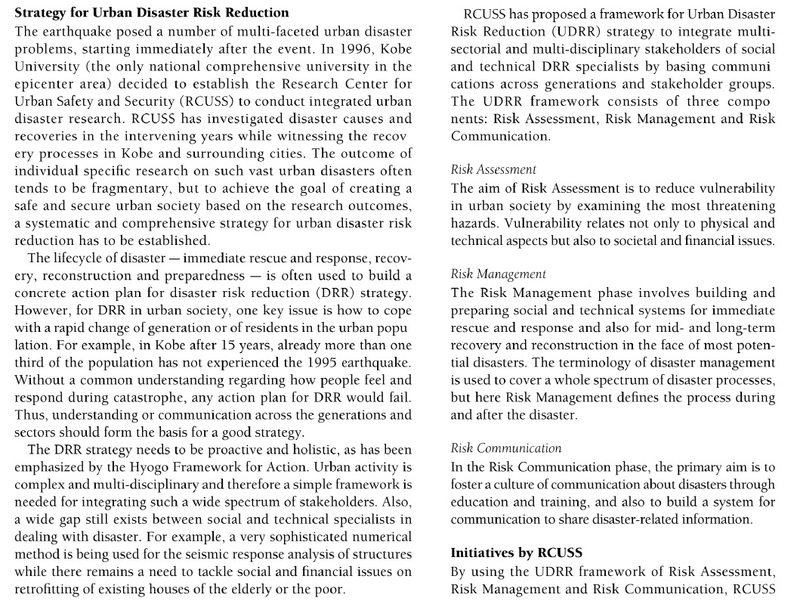 Specialists in Urban Disaster Risk Reduction (UDRR) are, however, not readily available because developing such specialists requires acquiring a comprehensive knowledge and understanding of both the scientific and the socio-economic conditions driving urban risks. Further, it requires a full heart of devotion and a commitment to bridging the people together. own unique cultural and historical commonalities, the regional solidarity plays a central role in building DRR strategy. So far, two workshops have been completed in Asia and MENA as indicated below. The Latin America workshop organized on March 5-7 2012 at Bogota, Colombia to complete the linkage among these regional UDRR efforts. and safety of schools and hospitals. MENA, and Latin America groups and the international organizations. from Colombia, and other countries. • International UDRR experts (Prof. Louise Comfort of Pittsburgh Univ. 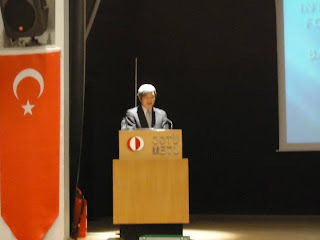 and Dr.
• Yasuo Tanaka, RCUSS, Kobe Univ. inappropriate population distribution along high risk areas, and many other issues. Considering the vulnerability of urban areas to earthquake and other natural hazards, the United Nations organized World Disaster Reduction Campaign in 2010 and 2011 entitled as "Making Cities Resilient". In this regard, several activities were carried out in different countries. 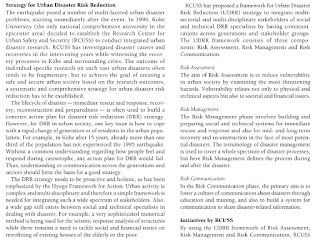 RCUSS, Kobe University is also organized a workshop in November 2010 about earthquake risk in mega urban areas and as one of the results of that workshop, it was decided to prepare a guideline for earthquake risk mitigation in urban places. For this purpose, a group of researchers from Middle East and North African Countries were assigned to prepare different parts of the manual. These activities were formulated into three main sections considering geological and geotechnical issues, building and urban infra-structures subjects, and disaster management elements. 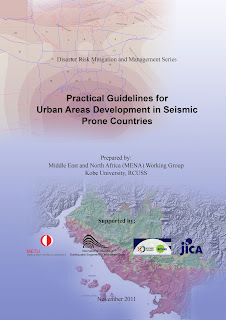 In each part, after introducing the subjects and the relevant challenges, the global experiences about each topic were reviewed, and some guidelines were presented to be considered for safe development of urban areas in seismic prone zones. This manual can be used by urban planners, as well as disaster management authorities as a guideline for organizing the relevant activities and implementing risk reduction measures. Kuzucuoglu (Turkey), Lamia Ali (Syria). First day of the workshop, presentations made by selected participants during morning session at METU Cultural and Conventional Center. 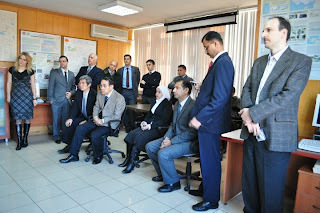 In the afternoon, the group visited the Earthquake Directorate of Turkish Disaster and Emergency Preparedness Authority and the Turkish Red Crescent. JICA Alumni kindly hosted a dinner in the evening. 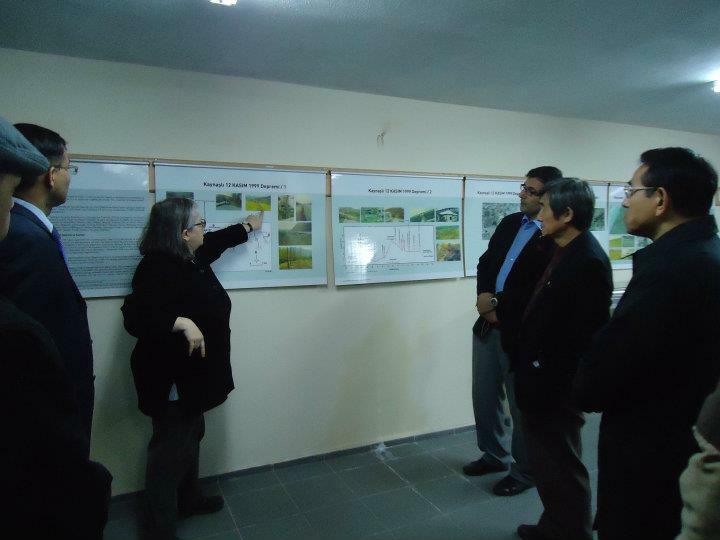 On the second day, a field trip to Kaynaşlı-Düzce is organised to observe the recovery process after the 1999 EQ. Ms. Tezgider presented this process, mentioning the difficulties the people had gone through and touching on how they were affected psychologically. She talked about what to do or not, to help people handle starting a new life. She also underlined the methods which must be followed by the government for this purpose. After highlighting that education is vitally important in disaster situations, she informed us about their projects as NGO to overcome the educational problems in the town. Having discussed the subject and exchanged ideas, the group left Kaynaşlı and headed to İstanbul. On the third day, Istanbul Seismic Mitigation and Emergency Preparedness Project (İSMEP) office is visited. After the introduction of the project, a study tour is organised to Vatan Lisesi, a highschool that is being strengthened at that moment. 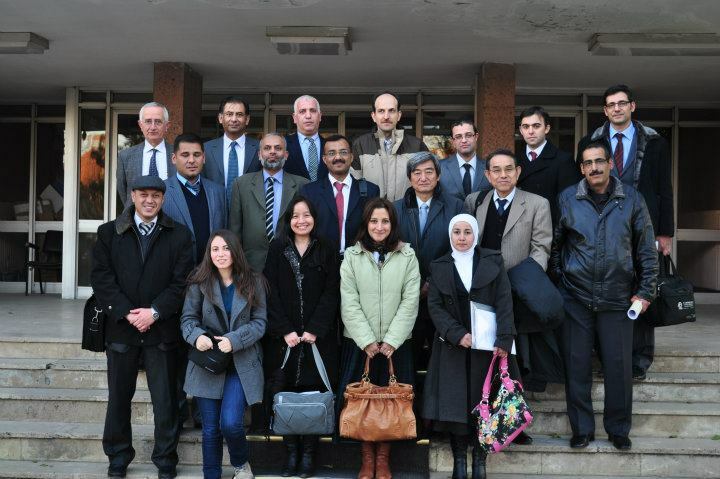 In the afternoon of the same day, the MENA participants had a closed group meeting. The conclusion of the workshop is to continue the network, which has been established among the JICA ex-participants on Disaster Risk Reduction (DRR) courses. We already have a mini-platform on DRR activities. This platform will continue collaboration. The guideline for urban seismic risk reduction in MENA region that has been prepared with the work of Dr. Kambod Amini of Iran, will be improved by the revisions/additions of MENA group members. 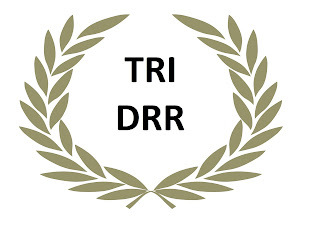 Copyright © Three Regional Initiatives for Disaster Risk Reduction "TRI-DRR"